Story by staff writer JM Merchant. Feature photo courtesy John Abram. ONE SUNDAY AT the end of October, tourists milling around Bankside (a district of London on the banks of the River Thames) and Shakespeare’s Globe (“dedicated to the exploration of Shakespeare’s work and the playhouse for which he wrote”) in the borough of Southwark are treated to an unexpected delight. 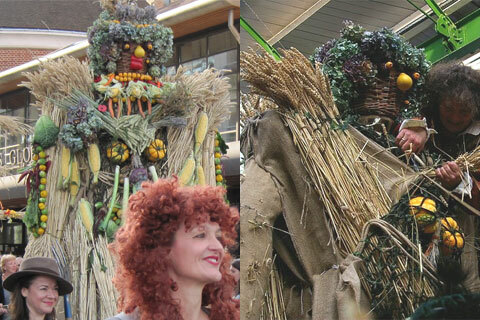 Every year, the Lions part presents October Plenty, an urban festival that celebrates the harvest in a brilliantly theatrical manner. I’ve been a time-traveler since the age of eighteen, and twice a year the Lions part—an eclectic company of performers who collaborate to create seasonal festivals, plays and theatre pieces—offers me the opportunity to show off my time-traveling get-up in my home town. This year was by far the mildest, weather-wise. For these events I typically wear jeans and T-shirt underneath my Tudor kirtle and then bundle up in scarf, gloves and cloak, so it was a strange feeling to be wearing just the kirtle. Just before midday, a man with a drum and a white bear playing a fiddle magically appear in the street on the banks of the River Thames. With jovial cries, music and dance, they intrigue and captivate the crowd. The performers are helped by costumed pedlars, such as myself, selling postcards, badges, programmes for the days events, and withy (willow) wands. 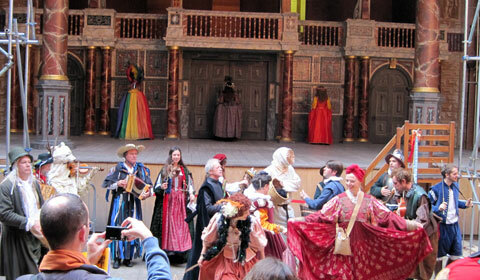 At twelve o’clock the rest of the company emerges from the Globe Theatre. 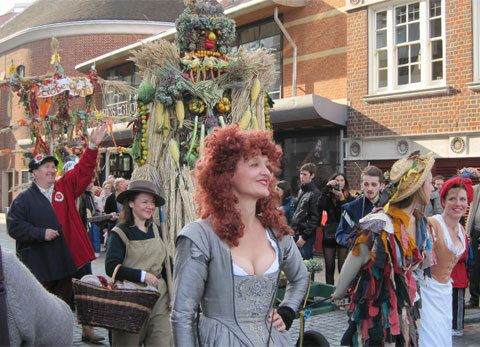 A lady with a bell leads a procession of colourful attendants of the great Corn Queen, an effigy of fertility and bounty drawn along on her wagon and accompanied by the stunning Berry Man, the autumnal incarnation of the Green Man. The procession leads the crowd into the Globe Theatre itself—though the Corn Queen has to stay in the street because we can’t get the wagon up the stairs. Inside the theatre the traditional Hobby Horse makes sport of jumping fences made up of members of the crowd before introducing the three goddesses: Iris, Ceres and Juno. With the company, the goddesses harmoniously sing the blessings of the harvest season. The goddesses then present a representative of the theatre with traditional gifts: a corn dolly for fruition of performance, and horse manure for fertility of ideas. 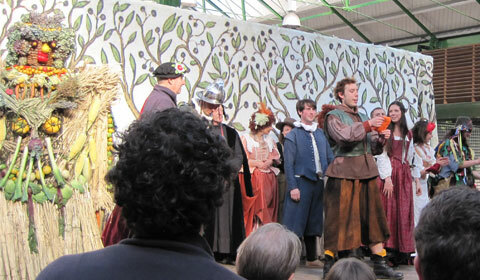 Of course, there’s more than one route from the theatre to Borough Market. The procession always takes the official route, and whatever that is changes from year to year depending on what part of the market we’re based in. The crowd, however, tends to splinter off in large groups. Thus, the short journey causes joyous havoc every year. 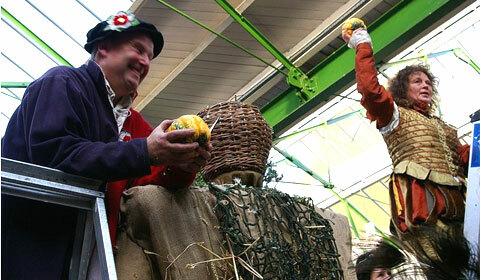 October Plenty always coincides with Borough Market’s Apple Day, a celebration of the apple harvest. The market is one of London’s most renowned food markets, with a huge variety of traditional British and international food stuffs; from family-butchered meats to the most diverse assortment of fudge you’ve ever seen. Apple Day means the cider sellers do a roaring trade, and there’s a stall that gives you the opportunity to sample all sorts of English apples that I had no idea existed. The apple-peeling contest provides much amusement, with heats for different ages, and the conker fights always result in a few bruised knuckles. 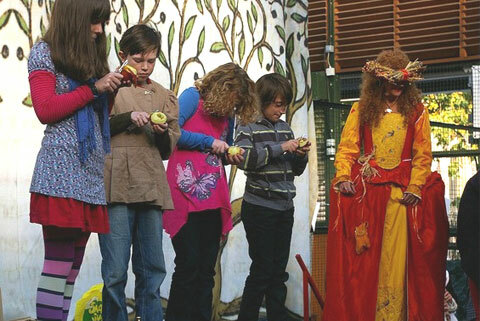 At our base in Borough Market, we build a small grove of young English apple trees, nicknamed the Story Orchard, where little members of the crowd can get away from the hustle and bustle to be regaled with tales of seeds and bees and apples. Here you can also make a wish to hang from the trees. It was here I had the delight of bumping into part of my time-traveling family, reunited with one of my many sisters and three of her children. Bees also get a shot at publicity during this event. The bee population is in serious decline in London and, as we all know, bees are essential for ensuring pollination of flowers and fruit-bearing plants. So next to the Story Orchard you can find advice about starting your own beehive and how to attract bees to your garden, and you can buy packets of seeds for the plants that bees like best. The play is always the main attraction for October Plenty. Each year a short(ish!) comic play is selected to be performed by the company. This year’s selection was The Marriage of Wit and Wisdome by Francis Merbury, a cheeky show in which the characters are all named after vices and virtues designed to tempt and sway the young man, Wit, on his quest. This performance is followed by “The Execution of John Barleycorn,” a traditional poem likening the stages of harvesting and malting barley to an execution that allows others to live. It’s just a bit of silliness, really. 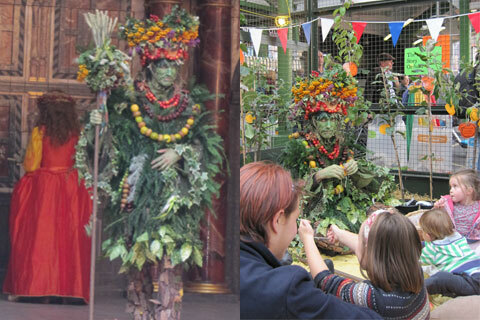 The festivities in Borough Market are then topped off with the stripping of the Corn Queen. Two days of hard work put into building the beautiful lady are decimated in a mere ten minutes when her fruits and plenty are savagely ripped from her and thrown into the hands of the waiting crowd. The last item to go is the breasts. These two lovely little squashes are auctioned off, this year making £46 to go toward the Twelfth Night Festival in January. 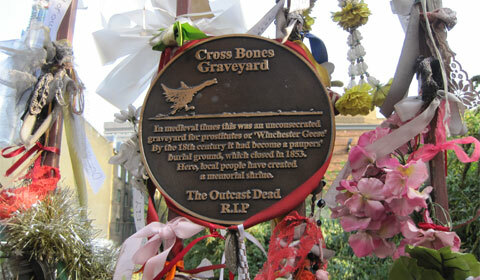 The final part of the day is a somewhat sombre walk to pay our respects at the Crossbones Graveyard, resting place of the outcast dead. The cemetery itself no longer exists. It closed in 1853, and was then built on and dug up by London Underground (a rapid transit system serving Greater London, also known as The Tube) in the 1990s. It has since come under the protection of a group called The Friends of Crossbones who are resisting the attempts by Thames Link to build over it again, and instead want to turn it into a community garden. 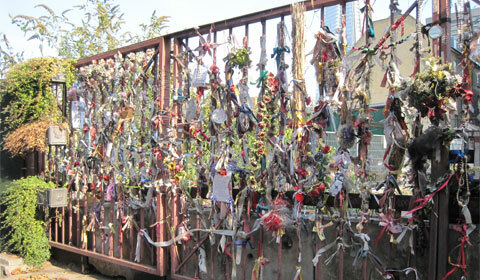 The rusty iron gates have been transformed into a shrine, not only to those that were buried there but to all outcast dead. It’s a sad fact that London residents are often so absorbed in the modern world that we forget the things that in times gone by were a great excuse for a party. 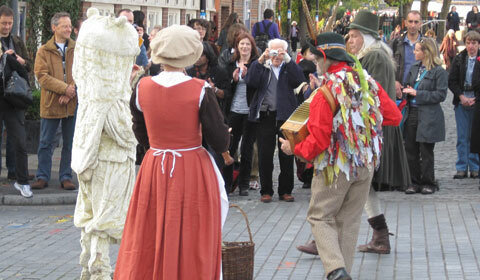 The Lions part have done a brilliant job of bringing back some of the old traditions, and October Plenty is a fantastic—and free!—day out for everyone. 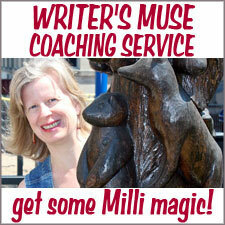 This is great – thanks for writing the article, Pip! Sounds like a fun day for the whole family! Great article! It’s always a lot of fun, and so different from anything else that usually happens in London. This looks like an amazing event/activity — very cool opportunity for time travel as you say! Incredibly creative and entertaining. I love the merging of theatre and history. Very cool! oops forgot this link, scroll down to see! Pip – you told it like it is (even if I’m not in any of the photos). See you at Twelfth Night or KW. PS – why just read about pirates -why not join us? Thanks for reading Mr Lawler. Ok, you’ve intrigued me…join you? I agree with you about the play but there’s not much can be done about the general public really is there. Well if you were to fly over, the Twelfth Night celebration is on January the 8th. 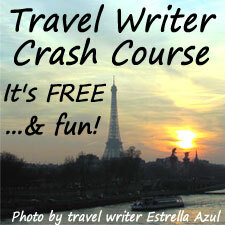 Your vivid article and photographs makes me feel like I was there! What a great harvest celebration. 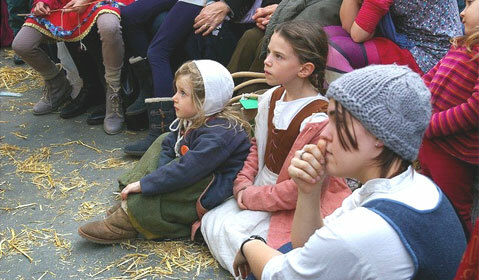 I love The Corn Queen, The Berry Man and you with your nieces watching so intently. Ah, the Story Orchard enchants me. What a fun day! Thank you for sharing it. This is great! 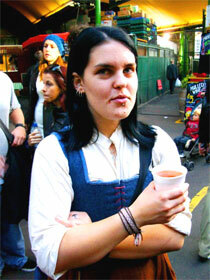 It reminds me of the Renaissance Festivals they have here in the states – only this one might be bigger! GREAT pictures and it looks like everyone had a great time! LOVE the costumes! I don’t think this is likely to have been bigger than one your Renaissance Festivals (although my only frame of reference for that is the Simpsons 😉 ) but our main re-enactment events at Kentwell probably do. wow! sounds like so much fun! is this annual? The very merry occasion, the corn queen and her cart, the inside of the globe theater, not forgetting the costumes.. they really depicts the world during shakespeare’s times. This is indeed a very interesting post, I have never read on this culture before. I hope it was as much fun as it sounds! Definitley bringing my grandchildren when they’re a bit older. It’s a really nice day out Wilmott, and if you come in kit there’s not the authenti-pressure you find with some other events. Hope you enjoyed your vacation..Looking forward to visit also in London.. Thanks Jessica, though it wasn’t a vacation, I live in London.